Climb the tower, find the grail! The downtown water tower was abandoned in 1924, its tank removed and a larger metal tower erected further west. The city long considered demolishing the earlier structure, but in 1938 sold the property to Raleigh architect William Henley Deitrick. Deitrick, who was garnering a regional reputation for modernist design, chose to convert the aging tower into his architectural offices. William had a great interest in Medieval history, crusades, and historic artifacts, some say he spent most of his life in search of Holy Grail. You have an hour to find out the secret of the Tower Keeper. 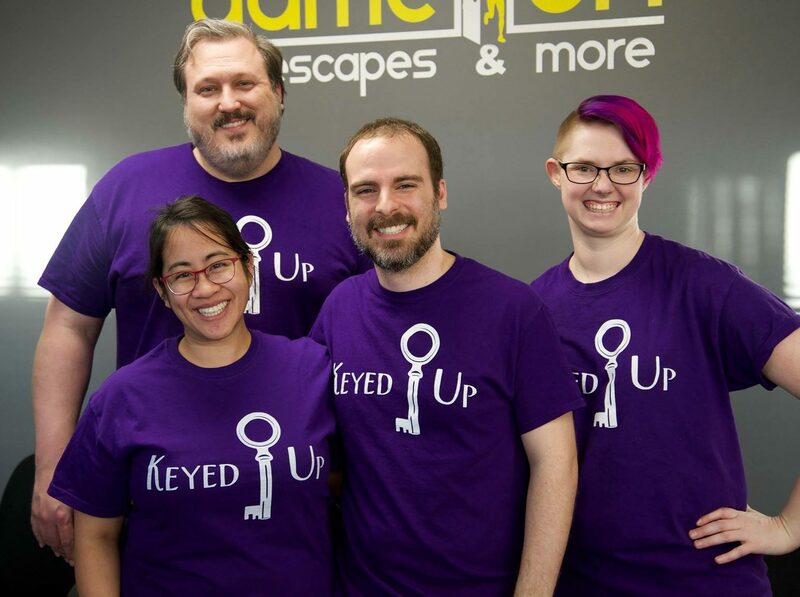 Speculative fiction themed escape rooms are usually a lot of fun, but when you couple that with being in the actual structure the story is based on, it adds a whole new level of immersion to the game! This was the room we were most excited about when visiting The Tower Escapes, as we were assured we’d be climbing the tower as we solved the puzzles! The escape room is in the back there. Don’t see it? It’s that giant tower. The storyline is imaginative and clever, and it luckily doesn’t end the second you begin the room as some promising themes tend to. In fact, the experience feels like a Da Vinci Code-esque adventure in the middle of downtown Raleigh. Wrapped within the original stone walls of the water tower, the sense of immersion is truly quite high. The story is delivered via the linear gameplay, which works well to gate off new revelations as you progress through the story. Puzzles are mostly intuitive, and the game flow works well between each point, giving great feedback to keep players on track. The puzzles sprinkled throughout the rooms are very original, with hand built tech keeping the whole thing feeling authentic. Several points along the way provide great reveals, keeping the surprises coming and the enigmas rolling along at a steady clip. The room itself isn’t overly cluttered, and it always seems like what you find is important, as long as you can make the connections. Signposting for hints is superb, with small details providing huge ah ha moments. Overall, the room is just satisfying to play through, puzzle-wise. Some information is provided via stickers, which seems a bit out of place overall and make the props look worse. The linearity is a double edged sword and can bottleneck groups, causing larger parties to have folks that are standing around waiting for puzzles to be solved. One particular part of the game involved entering a code into a randomly placed input device; I’ve never seen something like this hidden quite so strangely, and we were lucky to spot it. The ending is somewhat anticlimactic, with the story just coming to a sudden halt. Because of this, the room feels much shorter than expected, with everything stopping just as it feels like the game is picking up speed. With a highly original mix of puzzles and an engaging storyline, Secret of the Tower Keeper shows some real promise. While we found it to be a bit on the easy side, our group of enthusiasts had a lot of fun climbing the old water tower in search of the Holy Grail. A good choice for new players and enthusiasts looking for something out of the norm, I definitely recommend checking this one out! Book your time investigating the Tower Keeper’s secrets here! Full Disclosure: The Tower Escapes comped our tickets for this room.